I have spent too long pacing the streets of Ulan Bator. I am beginning to know every corner of them. There is of course the daily appointment with the Nagoya Basho at 4pm on NHK, but I long for the open spaces and the splendid landscapes of the steppe. Magnai, my driver and also a friend, suggests taking me to see Karakorum, the old Mongolian capital founded in 1220, and its monastery, Erdene Zuu. I can’t find any reason to disagree since I am, above all, very curious to see all that is possible to see in Mongolia; I accept the invitation with enthusiasm. So we leave the capital and its everlasting smog. Never mind the Nagoya Basho coverage, I will be back for senshuraku at the latest. Three hundred km of battered road and 100 km of track later we arrive at Karakorin, a village neighbouring the old city, in driving rain. Suddenly I think I see, on a large panel by the side of the road, a familiar silhouette behind the curtain of rain. Yes, it is really him, it is Asashoryu! Magnai tells me that Dagvadorj came from this village, and that three or four years ago he had a tourist camp built in the neighbourhood, named simply Dream Land! 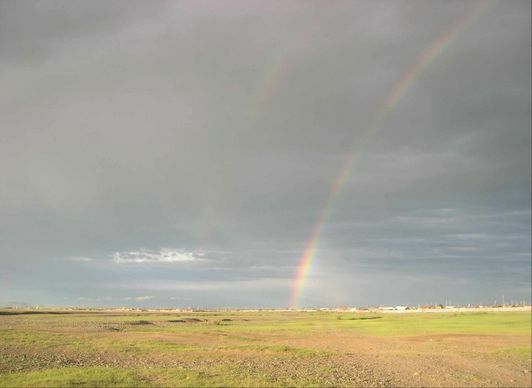 At once, the tiredness of the voyage vanishes, as if by magic, with the last drops of rain. Now I am very excited. I want to visit Dream Land and nothing else matters. It works out well since Magnai loves sumo too and is delighted with this opportunity. Dream Land is an island of greenery, a haven of freshness, in an area where there are practically no trees. In order to rest in the shade around here, you have to lie down on the right side of your car. But, in Dream Land, Asashoryu has had all kinds of trees planted for the well-being of his clients. It is as if one has entered another world. First stop, the restaurant. My driver and me are thirsty after the long journey. 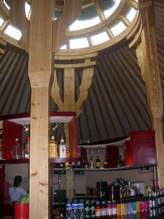 It is a vast, brand new yurt, and the inside is very beautifully designed. The bar is large and round, and well stocked with a wide variety of alcohol. Some rather well-to-do Japanese and Chinese tourists are seated at a table beside us. We are satisfied with a coffee, which costs almost ten times the price that one would pay in a small bar in Ulan Bator. Our dai-yokozuna is not doing this for the ordinary people! Once refreshed, we look at all the photographs of Asashoryu posted on the walls. There are some that I have never seen before. The "Boss" is not here, of course, since he is fighting for the yusho in Nagoya, but one senses his presence everywhere. And one especially feels the respect that he inspires here. While I press our hostess with questions about my favourite yokozuna, Magnai takes the opportunity to go and photograph the interior of the yurts. Unfortunately these photographs didn’t come out, so I can’t show you them. But he assured me that they were very beautiful. The girl, leading us by narrow shaded alleys to the central building, replies to my questions good-humouredly. “What is he like in private, when he comes here to rest after the basho?” I dare to ask. “He is very funny. He loves to laugh and joke. He creates an atmosphere, you know!” She is very curious to know how somebody like me became a fan of Asashoryu and sumo in general. I willingly tell her how it came about. We are now in front of the central building with its offices and its hotel rooms. Our young hostess tells me that this building is more than 300 years old. I am so flabbergasted, because it seems brand new, that I forget to ask her what it had been used for before the camp was built. Lined up next to the restaurant yurt, the luxury yurts cost $55 per person per night. The standard yurts are $25. To give you some perspective, you pay around $8 per person per night for a room with 2 or 3 beds in a guest-house in Ulan Bator. In tourist areas, certain stockbreeders rent beds in yurts for less than $2 per night. Our young hostess, with an innate sense of the theatrical, saves the best for last. With a grand hand gesture, she points to a large splendid yurt, warning us in a quiet voice that we should not expect to go in there because it is locked. A suddenly more mysterious atmosphere obscures the lightness: it is the yurt in which Asashoryu got married! The door of this yurt is the finest I have seen: extremely fine drawings in high relief in traditional Mongolian colours. I put myself in the photograph to show the size of the yurt. Those of the stockbreeders of the steppe are much smaller; it is necessary to bend double to enter them. This yurt must hold at least 50 people. The visit is over. One breathes in calmness at Dream Land. The air is pure and the pace of life is slow. I understand why the yokozuna comes here to recharge his batteries after the tournaments. We look at the mountain behind Dream Land, and realize once more that the young yokozuna is fearless. For me, on the other hand, just imagining him descending those steep slopes on this machine gives me shivers down my spine. He could have broken his neck. Or worse, dirtied his clothes on his wedding day! He has a taste for danger, Asashoryu. "It is time to leave", Magnai says, "if we want to cross the river before nightfall". We say goodbye to our pleasant hostess, who promises that she will tell Asashoryu about my visit when he returns. I missed him by only a few days. I promise myself that I will return next year, after the Nagoya Basho this time. And then at last I will meet him.